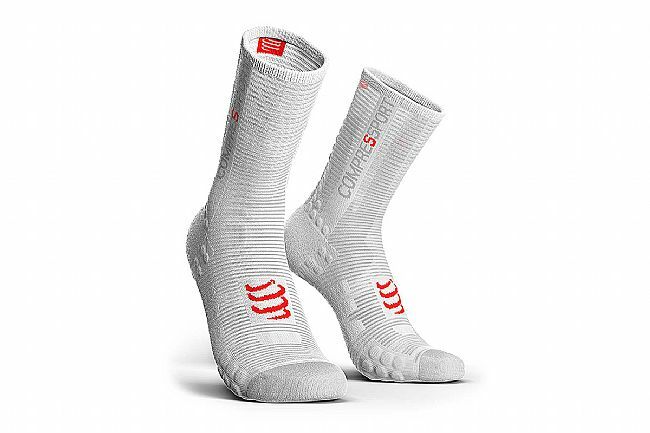 The Racing Socks V3.0 Bike Smart from Compressport feature thermo-aerated mesh and seamless construction, ensuring dry, cool, and comfortable feet. 3D dots sewn into the sole provide cushion, grip, and acupressure which activates blood circulation. Structural reinforcement at the ankle, arch, and toe box facilitate optimal foot posture, increase stability, and reduce shock. No doubt the best socks I've used . Just enough compression and the material is perfect for comfort and looks. Wish BTD would get more in stock soon in my size (T4) and also get them in red if available. Super comfy ,no hot spots,compression features throughout!